Roulette is a game that has been designed purely for entertainment. The grandeur and big wins associated with roulette make it one of the most popular casino games, and easily one of the most familiar from it's appearance alone. But enough about the background story, how can you go about getting the most enjoyment from the game possible? Play as much as you want, and bet as much as you want. 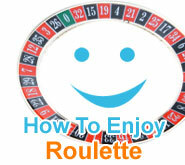 The only way to play roulette is the way you enjoy it the most, there are no set rules to it. Just because the guy next to you is betting copious amount on each spin, it doesn't mean you have to do the same. If you want to bet the minimum each time, go ahead and do so. If you're having fun, then that's all that matters. There are no strategies that are better than any other, so place your bets however you want. If you think you have a good system going, then stick to it and see how it goes. Place your bets as strategically as you like and don't let anyone tell you you're wrong. Just be sure to remember that the house always has the edge at the end of the day and you can't go wrong. Whether you play online Slots, Craps, Baccarat, Blackjack or even that funny little game called Roulette, it's never going to be much fun if you're risking more money than you can afford to lose. Always play with an amount of money that you would be comfortable with losing. We can all dream about hitting those big wins from time to time, but the reality is that there is a good chance that we can lose our money too. If the thought of losing X amount of money makes you feel ill, then you shouldn't be playing with it in the first place. Roulette is a marathon, not a sprint. It isn't going to be much fun in risking it all on one spin and losing, so stretch our your play and get your money's worth. The smaller the bets you make in relation to the amount you are playing with, the more time you are going to be able to spend at the tables. Take your time and enjoy yourself at the table, you're in no hurry to leave... online casinos are open 24/7. If you ever feel like you have to play, then you really shouldn't be placing any bets. If you've won a decent amount and want to leave the table, then go ahead and leave. Keep your winnings and enjoy them. You should only play roulette because you want to, and not because you feel that you have to. Play it safe and set yourself limits. Always remember that roulette is your game, and you are in control of what takes place at the table. Play however you want and don't let anyone tell you otherwise. If you're enjoying yourself whilst placing bets, then the roulette wheel is doing its job properly.